Hard Fern is not easily confused with other wild plants on this web site. This is a fern, which like many similar ferns, remains green throughout winter. In spring it produces fresh bright green fertile leaves which contrast with the darker and sterile leaves of the preceding year. The pinnate, comb-like sterile leaves (10-15cm long) spread in a rosette with the young spore-producing leaves growing erectly in the centre, the apex being coiled tightly initially. 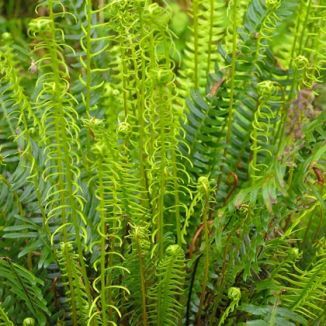 This fern is frequently found on acid soil, along shaded ditches and in mountains. It belongs to the family Blechnaceae. I first recorded this plant in Glenmalure, Co Wicklow in 1996 and photographed it at Laragh, Co Wicklow in 2007. 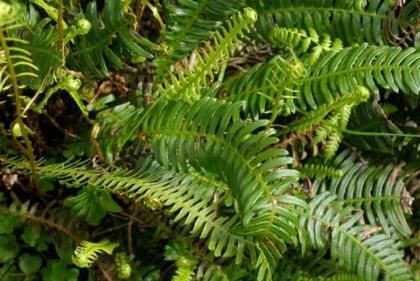 On this website I have included some ferns (Pteridophytes) which can be found growing in Ireland, because, although they are not flowers, I know that persons interested in wildflowers usually find other forms of plant life quite absorbing. Ferns do not produce flowers and fruits but are spore-producing plants which possess vascular systems and produce roots.